What does it take to be a PR pro? Ethics tops the list of qualities identified by TCNJ students. 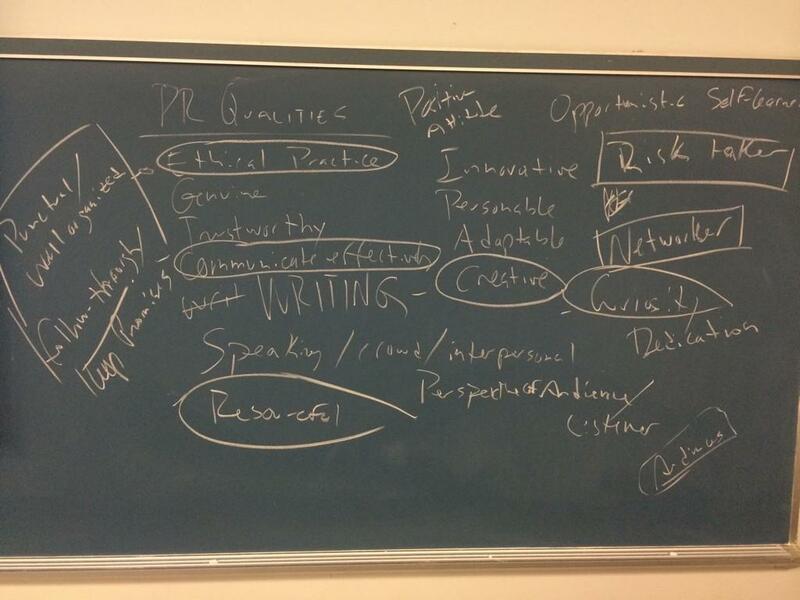 Qualities of a PR pro chalked onto a blackboard in Jake Farbman’s PR strategies class at TCNJ. The students with whom I spoke were taking Adjunct Professor Jake Farbman’s class on PR strategies at The College of New Jersey (TCNJ) in Ewing, NJ. I had eagerly jumped at Jakes’ invitation to meet this group of future PR, marketing and journalism professionals. Inexcusably, this was not on the list of qualities I had scratched on a piece of paper before class started. But I was excited to hear the students put ethics at the top of their list! Here’s why: Most folks think PR guns are like those Madison Avenue Mad Men on TV who will do any kind of foul and underhanded thing to snag clients, bury the competition and make the big money. Subtext: Ethics be damned! Yet, nothing could be further from the truth. When it comes to ethics, I share the students’ idealism, and so do the senior PR pros in my professional PRSA NJ network. We are PR professionals with high standards, and we adhere to the PRSA’s code of ethics. With inevitable exceptions, we are an honest bunch. Effective communicators: We can write and speak with persuasive confidence. We are good story tellers who know how to engage an audience and hold their attention. We are ruthless editors of our own writing. Resourceful: We can get the job done with available—and often scarce—resources. We are self-motivated and perpetual self-learners, quick to seize opportunities that might not be obvious to others. We persevere in the face of obstacles. Creative: We can take the ordinary and spin silk from it. We can capture peoples’ attention in words and images. We can “envision” a PR project from inception to completion. We enjoy trying to solve a difficult problem. Risk Takers: We are willing to take reasonable risks to get the job done. We are not afraid to advocate for our ideas and to persist in the face of skepticism, even if we are the youngest PR practitioner in the room. Biddle’s Bottom Line: Jake Farbman’s class of PR students heralds a bright future for the profession. If you are a PR practitioner reading this blog, please add to this list and share your comments. I would like to share them with Jake’s class.